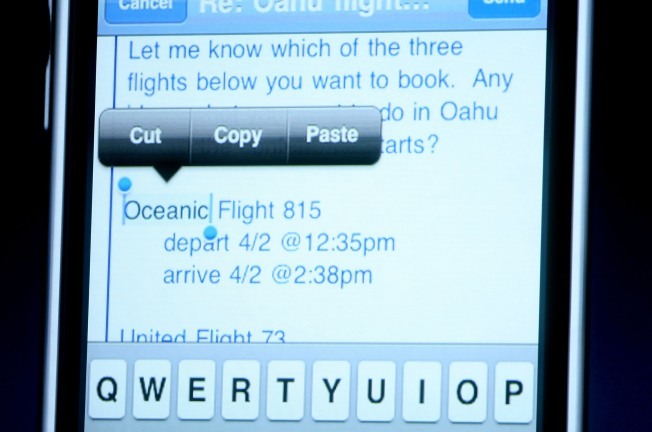 A demo of the new cut and paste feature for iPhone is seen on the screen during an event announcing the new operating system for the iPhone March 17, 2009 at Apple headquarters in Cupertino, California. Finally! You can cut & paste information between apps. Double tapping on text brings up a ‘Cut, Copy, Paste’ bubble. If you make a mistake, shake to undo. Push notification is integrated into the OS for 3rd party applications. Now you can get your AIM / Facebook notifications automatically on the home screen instead of having to launch the app every time. Apple opted against supporting full multitasking because of performance and battery life concerns. Sorry Pandora users, you still can’t play your music in the background. A new universal search feature allows you to search applications, email, contacts and more from one screen. Email users will enjoy the ability to type in landscape on the larger keyboard. You can send pictures using MMS. Wireless connectivity has also been improved and stereo support has been added. You can connect to a friends iPhone using Bluetooth. This let’s share information like business cards or even play peer-2-peer games without needing a WiFi connection. Accessory makers can also use Bluetooth to communicate with their devices. The iPhone can now control a device directly. So if you have a docking station with speakers, the iPhone could adjust the speakers equalizer. Turn by Turn applications are now officially supported. New enhancements will make it easier for programmers to create GPS and mapping programs. The stocks program has been enhanced and includes news and information below the stock quotes. A new Voice Memo feature was added allowing you to record, save, and email voice notes. You can shake iTunes to shuffle tracks. The notes application can sync with iTunes. Video streaming services have been improved and can adjust the playback quality based on your connection speed. Developers have the ability to sell subscriptions and content with in an application. Magazine, eBook, and city guide publishers for example can sell new editions from inside their own program rather than having to create separate apps for each one. Game developers can sell new weapons or levels. Apple faces tough competition with the upcoming release of the new Palm Pre which improves on many of the elements that made iPhone popular. Google recently released an update to its Android OS as well.The new OS will be a free update to iPhone customers (for iTouch it will cost $9.95) and is expected to be available this summer.